Alright, alright. 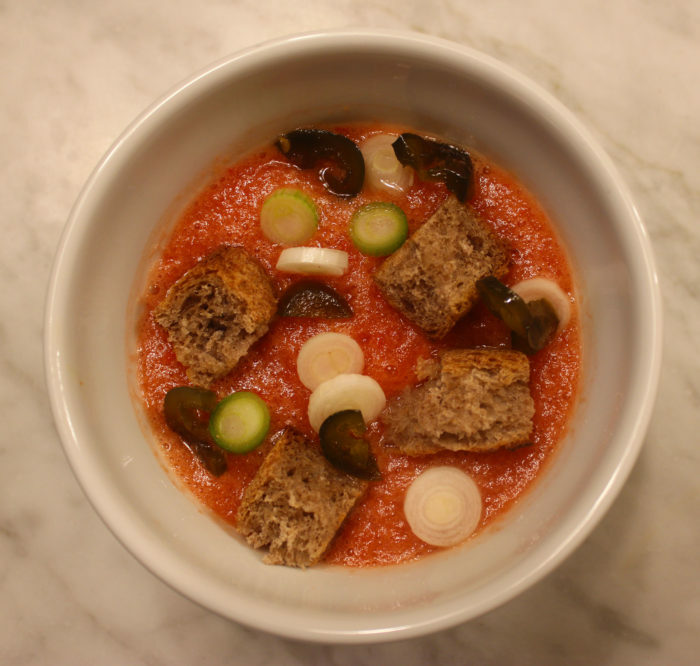 I hear some of you mumbling: yet another gazpacho recipe. Yes. And I will warn you that there will be more. I’m sorry, but I love, love gazpacho and I’m always in search of great recipes. When I got divorced, I bought a blender because while I was living in friend’s garage, I saw a cooking show on PBS where they made gazpacho. I got an apartment soon after. And, for a while, my diet was gazpacho, Caesar salad, baked chicken breasts [dipped in mustard and covered with bread crumbs] and brownies. I still cook them all. Still eat them all. And I’m fascinated by the different ways you can make those four basic dishes of life. Take gazpacho. I do appreciate the very thin, elegant soup served in restaurants where the ingredients have been pureed for hours. I can’t achieve that at home. Instead, I go to the other extreme looking for a thick, peasanty soup with flavor bite and orange color. This recipe provides just that. The thickness comes from the relative amount of solid and liquid. I have some croutons on top, but there is no stale bread in the soup itself. The flavor punch comes from three sources: good red wine vinegar [as in a little pricey], a red pepper and red pepper relish — available at many farmers markets or online from Stonewall Kitchen. They call it “Farmhouse Red Relish.” You can use it with cream cheese for a perfect appetizer. I made this first without the olive oil and I learned a lesson. The soup needs the olive oil to bind the ingredients so they do not separate. This soup is too thin without the olive oil, and thin in a bad way. Unattractive. The olive oil, just a little, performs chemical magic. As always. 6 plum tomatoes, about 28 ounces, peeled. Yes, to get the texture you want, you have to peel the tomatoes. Have to. Put on a large saucepan of water. Prepare a large bowl with ice and water. When the saucepan is boiling, dip the tomatoes in for 30 second. Pull them, put them in the ice bath and wait two minutes. The tomato skins simply fall off. It’s easy. Put all the ingredients in your blender and crank away. You want to blend for at least a minute. Pour into a container and refrigerate until cold. Serve with the toppings you like.